What problems do communities from the DRC, Kenya, Rwanda, Tanzania and Uganda that have never met before all share? Land. ‘There is one problem that cuts across all the five countries. This is land. Most of the communities we’ve worked with have been evicted,’ says Felicien Balikunda, MRG’s capacity-building officer. The project has focused on raising awareness and reducing injustices like forced evictions by governments, faced by these minority communities over decades. One strand of this work has been to identify communities who are not organized or who are just beginning to get organized and support nascent organizations to form and develop. Organizations were offered one-to-one capacity-building support and also opportunities to come together to learn from what others were doing and share strategies. Not only did they have new lessons to take back to their own communities but also a sense of confidence and hope. They were able to see people like themselves, battling injustices on a daily basis. Yet, it was also a reminder for some of how good their situations were compared to others. ‘It was like going to the hospital when you are sick, but when you get there you see people who are worse than you, ah me I’m okay,’ says Balikunda. These workshops were powerful and happened several times in the project. One approach to combating government oppression that has been highlighted by multiple communities has been the paralegal training. Says Kabajuni, ‘I know the power of having paralegals in these societies and the power of what paralegals can do to address some of the social challenges, especially that are related to violations of these ethnic minorities’ rights.’ These paralegals, who know the community structures they are a part of, have been taught people’s legal rights, how to protect them, how to seek legal advice, how to resolve disputes and human rights law. These paralegals have a significant impact at the grassroots level. They are often the first to identify and be able to report on abuses and human rights violations in the community. They also receive reports from community members who are taken advantage of or abused. This paralegal training is emblematic of the capacity-building that was evident throughout the project. According to Shobha Das, former MRG director of programmes, the project aimed to ‘network with low-capacity, high-energy minority organizations in the region’. 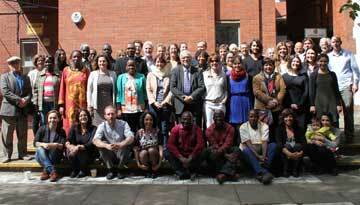 These grassroots or emerging partners with limited capacity really benefit the most from the project. MRG believes that strong organizations will more effectively represent and advocate for the rights of the communities they represent as they become more audible in the larger civil society. Before any capacity-building could take place, Balikunda would do a capacity needs assessment to identify gaps in an organization and prioritize which needs should be addressed first. Sometimes the capacities are so small ‘they don’t have facilities or a permanent office, so at times it is difficult to find them, so we would have informal meetings in restaurants,’ says Balikunda. Balikunda would provide these partner organizations with technical support and bursaries to improve their management capacity, governance processes and internal systems. It was important to train them in organizational management, how to draft a concept note and project proposal, how to report after an activity and make a financial report. 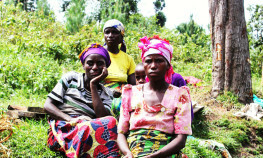 In addition, MRG played a significant role in establishing Women’s Organization for Promoting Unity (WOPU), the only Batwa women-led organization in Rwanda. Supported by MRG, WOPU was granted a Certificate of Registration; it now operates as a recognized NGO in the country. WOPU supported Batwa women to meet with their respective local government leaders at district level to discuss issues of food security, promotion of social integration of Batwa women in the different poverty reduction programmes, facilitation of access to agricultural land for Batwa women and how the pottery products that Batwa community members often make for a living can be promoted in the midst of a stiff competition from cheap Chinese products on the market. ‘One example I am particularly proud of is our recent work with the Ik in Uganda,’ says Claire Thomas, MRG’s deputy director. ‘This is a community that has been excluded and ignored for decades. Even in Uganda few people knew about them and even fewer cared what happened to them. For a while, we wanted to do work but nothing moved as there were no leaders in the community. All the Ik who managed to somehow get an education left the area – and why wouldn’t they, as there was no work there. But in the last three years a small group of Ik with some education and rights awareness is emerging and, amazingly, in 2016 someone from the Ik community was elected as an MP in Uganda. MRG was there ready to support this emerging group as an organization formed, Ik Agenda for Development Initiative (IADI), and to take its first steps, hold some local-level activities, begin to gain a track record.’ Balikunda adds, ‘MRG always invites them to meetings involving minority and indigenous communities for exposure and learning from others.’ As a result, there is more hope for equality and inclusion for children of the Ik growing up today than at any time in the last 40 years. The Irish Aid project has been consecutively implemented for eight years, which has given MRG and its partners time to look at the achievements and keep working on improving the gaps that still exist. The project has been renewed until 2018. It is rare to have projects run this long consecutively, but it is vital for the work being done in Central and East Africa with these highly marginalized groups.